In preparation for the opening of the newly created Bayfront Park in 1925, the City of Miami extended SE First Street from SE Second Avenue to South Bayshore Boulevard. The boulevard was later renamed to Biscayne Boulevard. Prior to the extension of the street, the land being constructed in the photo (Figure 1), was part of Royal Palm Park. The park was privately owned and associated with the Royal Palm Hotel. 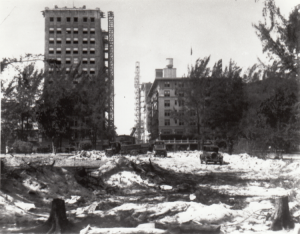 By the early 1920s, the people of Miami felt the need for a city owned park and began the planning and construction of Bayfront Park. 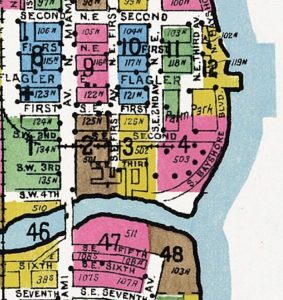 Figure 2 is a Sanborn Map showing the layout of South First Street and Royal Palm Park in 1924. On the left side of the photograph is the Huntington Building. It is located at 168 SE First Street (southwest corner of SE Second Avenue & SE First Street), and was under construction when this picture was taken. The building opened in the summer of 1926. The Huntington Building is still standing today and used as office condominiums. Figure 2: Sanborn Map in 1924. On the right side of the photograph was Hotel Urmey. It was located on the northwest corner of SE Second Avenue and SE First Street. The hotel was built in 1916 and opened on January 4, 1917. The hotel was razed in 2005 and the Centro Lofts recently opened at the former location of “The Urmey”. The featured photograph in this article is part of the Gleason Waite Romer collection at the Miami-Dade Public Library. Romer photographed a lot of Miami and surrounding areas beginning in the 1920s and into the 1960s. He died in 1971 and his collection of negatives were donated to the Miami-Dade Public Library in 1998. Cover: Work on SE First Street in 1925. Courtesy of Miami-Dade Public Library as part of the Romer Collection. Figure 1: Same as above (larger). Figure 2: Sanborn Map: 1921 – 1924.